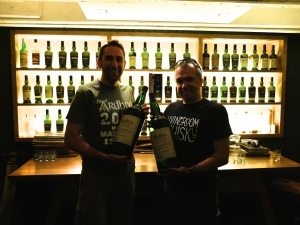 Back in August, Mike and I completed the Ardbeg Islay Half Marathon. It was a fabulous event and we both came away with personal best times despite the inclement weather on the day. To be fair we were well fuelled by porridge from Andrew and Alison at The Bowmore House (which we heavily recommend for any Islay stay), and well supported from the locals who saw us out and welcomed us back to Bowmore. 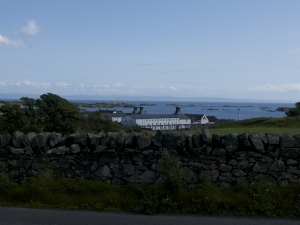 The run itself is a great out and back route – out over the continuous incline of the high road, and back over the undulating low road before a final climb up to the round church and a descent to the sea shore sees a hard mornings effort rewarded with a buffet, whisky (Ardbeg of course) and beer in the local Bowmore Hall. Ardbeg sponsor the race well, it has a great community feel to it and there are prizes for almost everyone who takes part. We didn’t manage to win any but we did enjoy the Ardbeg after the run so we’re not complaining. Speaking of the run – it is very well organised so do take a look at their website and consider adding it to your 2015 calendar. This year £12 bought you entry to the race and buffet, while another £8 entitled you to go the to the evening ceilidh in the village. It’s incredible value for money. We couldn’t really visit Islay and not go to Ardbeg itself so a couple of days later we found ourselves standing in the sun in the distillery courtyard about to embark on a great distillery tour. We were led around by Neil (who is incidentally a cousin of John, Laphroaig’s manager). Neil expertly led us around the distillery and was a great source of information throughout the visit. 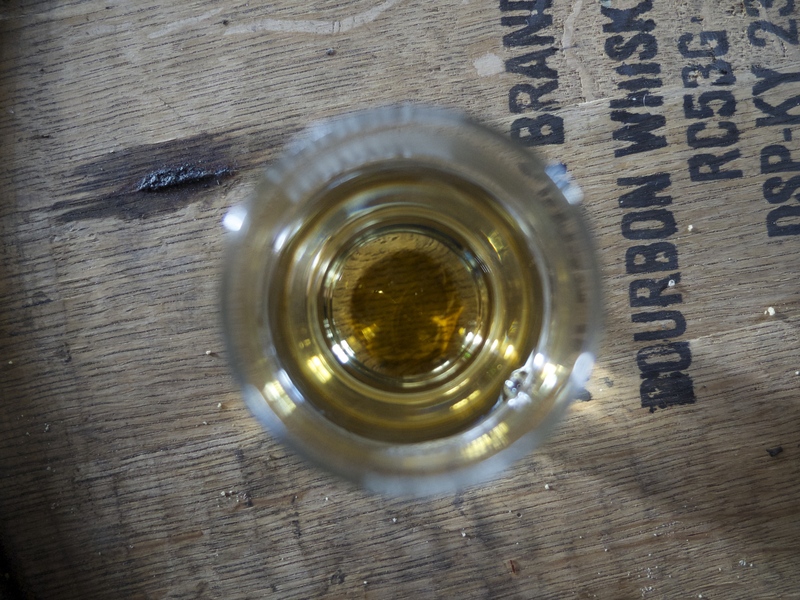 We started in the old Malting Floor where we enjoyed a cask sample while Neil explained the history of the distillery, and tales of smugglers and customs from years gone by. Nose: sweet, plummy and lots of liquorice. Quite grassy and vegetal with some lovely hints of blackberries and a touch of aniseed. Palate: Lots of red fruits among some classic Ardbeg flavours. The earthiness comes through strongly again, measured by some blackjack sweets and some charred steak. Finally we found some freshness in the form of green apples. Finish: lingering peat, blackberries. Sweet and earthy. We were then taken on a very informative tour around the site, passing each stage of production all the way to the still room. Neil was much more than a tour guide he was a real source of information and childhood stories from present and past distillery employees and we loved the personal touch he brought to the tour. 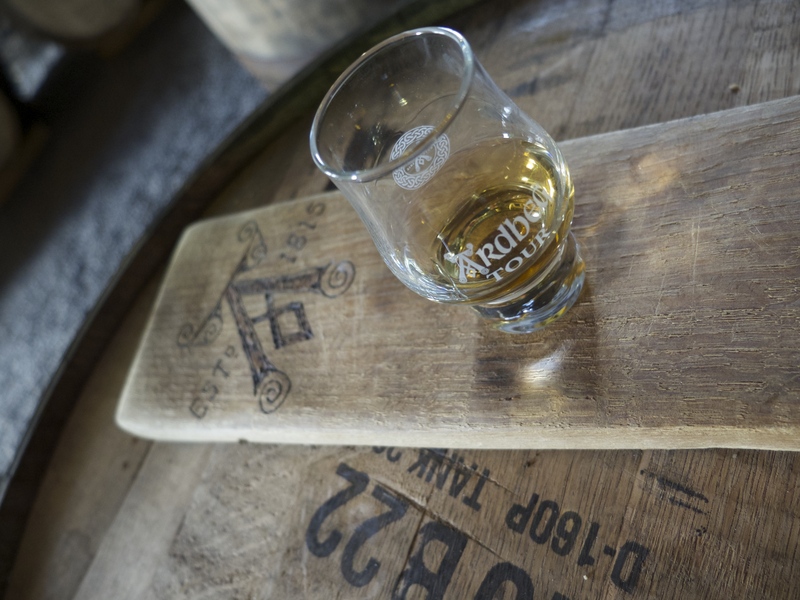 Following a brief stop in in the filling room we were led into one of the warehouses for a tasting of an old favourite – the award winning Ardbeg Gallileo from 2012. This fabulous whisky has been reviewed previously on this site – indeed I was lucky enough to attend the launch at The Leicester Space Centre – and is from a mixture of bourbon and sherry barrels. We were then led inside to the managers office for a final couple of whiskies; Ardbeg Alligator, and first the very recently released Kildalton. The recent incarnation of Kildalton is peated to 55ppm and is a curious mix of bourbon and sherry casks, some young and some old. It has been created as a one off batch as is initially only available at the distillery on Islay where it has been selling phenomenally well. It may be unlike the original Kildalton of the 1980’s but it is a lovely whisky and I enjoyed it so much that I left with a bottle. 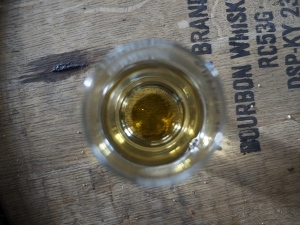 Palate: Initially light, the whisky builds to a crescendo as smoke fills the mouth. Lots of spearmint and Jacobs crackers. Ham and honey. Finish: Long and sweet. The smoke clings and refuses to let go. Following out return home we received a sample of Supernova in the post. It would have been remiss not to review it and this seems like a very good time to do so. This is another cracking release from Ardbeg, but you don’t need me to tell you that given it’s sold out everywhere. Personally I prefer the build of the new Kildalton Project, but that doesn’t take anything away from this whisky. If you can find some, then I’d recommend a purchase. It may not be the peatiest whisky around, but the complexity and balance of it makes it a winner. Nose: A lovely combination of smokey bacon and caramelised meat fat. The Ardbeg hit comes through in the form of sweet peat, some floral notes and a big dose of menthol. This is a real meat lovers whisky, and it opens further to reveal deep fried onionrings and fresh sea salt. Palate: There is a lovely amount of spice on the front of the tongue, this builds and envelops the mouth. The spirit is well balanced and savoury before meaty sticky ribs cooked in a kiln overtake the senses and provide a mouth coating hit. Finish: Long and gentle. The smoke and peat cling for a while, before ebbing away into the night. Thanks to all at Ardbeg for helping to organise our visit, and in particular to the staff at the distillery who made our trip so enjoyable. We’re already looking forward to our next excursion which will be Feis Ile 2015 and Ardbeg’s 200th anniversary.